The Chamber Ambassadors act as a voice and networking arm for the Chamber. 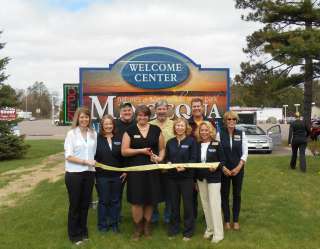 Chamber Ambassadors welcome new businesses to the community, host ribbon cuttings and are also responsible for maintaining relationships with current members, as well as encouraging potential members to join. Chamber After 5 events are held as booked. Any month is open for a member business to host or co-host an event. Chamber After 5 events offer members the opportunity to bring others into their business and showcase what goods or services they offer. This is a free event open to members. It is a great opportunity to make new contacts, socialize and network in a fun & relaxing atmosphere.